Mr. Kucera posing outside of his office in the lit center. Editor’s Note: This is the first in a series of features about administrators, highlighting various adults at Niles West. Children, helping others, and English are the three things that are important to Lit Center teacher and newly appointed director of English, Michael Kucera. Interacting with high school teenagers on a day-to-day basis while tending to their academic needs demonstrates a glimpse of why Kucera loves his job. When trying to figure out what he wanted to pursue, he automatically recognized he wanted to work with kids. When Kucera began working at West, he knew the lit center would lead to direct interactions with the student body. 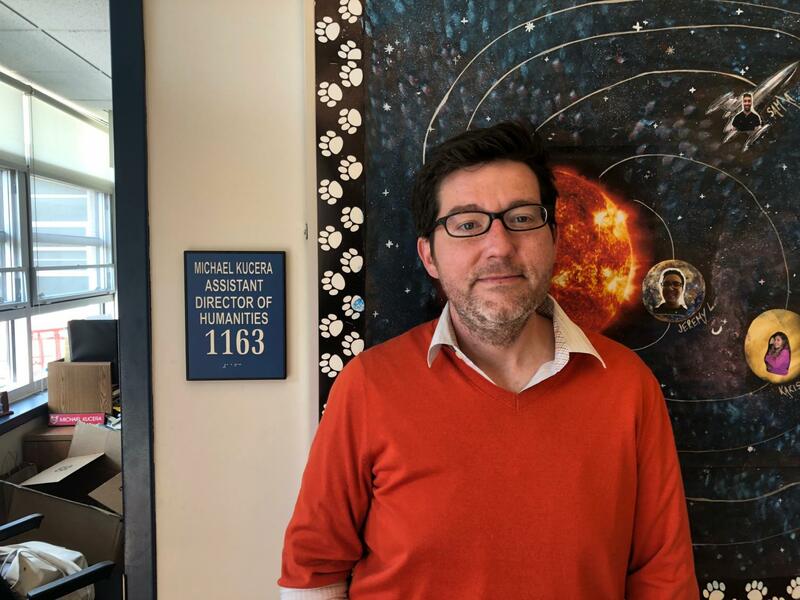 Many students and teachers know Kucera as the “lit center guy,” but few are aware of his most recent promotion–becoming the director of the English department. Kucera’s love for English is evident in is actions, and he hopes to continue to spread his knowledge to those around him. “For as long as I can remember, all I ever wanted to be when I was growing up was a teacher. For me, through both elementary and high school, the most influential people in the classroom were my English teachers. They taught with joy for reading and writing, made assignments interesting and relatable, pushed my thinking, and were never short on critical feedback,” Kucera said. Many students find the lit center an extremely useful place to go. Whether you need help with homework or want to review before a test, the lit center is a popular resource. “Mr. Kucera brings a welcoming energy to the lit center and always does his best to help whoever walks through the doors. He approaches students with a fresh and positive attitude to help them succeed and have an ‘ah-ha’ moment. He is always excited to see all the students come to the lit center to get the help they need and leave feeling good about themselves,” lit center tutor and junior Anna Darville said. Students aren’t the only ones who are grateful for Kucera. Faculty all around continuously praise his dedication and promise to lead young kids to become academically successful. Student activities director Katie Odell recognizes his impact not only within the lit center but in relation to her personally. Whether going to the lit center for help or interacting with the English department, Kucera is represented through the success of those areas. Kucera takes on his job step-by-step, one day at a time. Dying to know if Michael Kucera is any relation to my favorite teacher of all time, the beloved Mrs. Kucera who taught 5th Grade at David E. Walker school in Evanston District 65 in the 1960s.